The On Behalf of Queue option is for those agents who would like to place an outbound call, such as a follow-up call, on behalf of an inbound キュー without going On Queue. 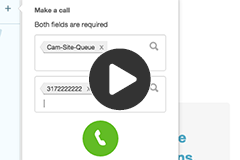 The On Behalf of Queue option allows an agent to place an outbound call related to a queue without receiving other interactions. The agent receives credit for the call because the call statistics are associated with the selected queue. In the Enter Names and Numbers field, type the name and select the person from the suggestions listed or type the phone number and press Enter.